The Roman Warm Period covered the interval from about 250 BC to about 400 AD. It had helped to bring the Roman Empire to its apex, when the City of Rome had about one million residents. The might, size and wealth of the Roman Empire declined when the Roman Warm Period came to an end. The decline of the Roman Empire can be discerned in the trend of the size of the population of the City of Rome over time. There should be little doubt that the fate of the Roman Empire was strongly tied to the Roman Warm Period that had helped to bring it to its apex and to the downturn in temperature trends that brought an end to the Roman Warm Period and continued long after. The weather events quoted here took place during and after the Roman Warm Period, until the time of the start of the Islamic Conquest of the World. For records of subsequent weather events, refer to the Chronology that is the source of the quotes shown in the following. The following quotes are only for instances of weather events whose descriptions contained the character strings: Rome, Danube, and Rhine, for the interval from 1 AD to 633 AD, the beginning of the Islamic Conquest of the World. 15 A.D. In Rome, Italy, the Tiber River overflowed and did such serious damage that it was proposed in the Roman Senate to diminish its waters by diverting some of the chief tributaries.47, 92 Also refer to the section 14 A.D. – 15 A.D. for information on the famine in Ireland during that time frame. – Theodomir (King Theodomir of the Ostragoths Amal) with his army crossed the ice on the frozen Danube River to avenge his brother’s death. The second phase of the Barbarian Invasions, from 500 AD – 700 AD, saw Slavic tribes settling in central and eastern Europe (notably in eastern Magna Germania), gradually making it predominantly Slavic. Additionally, Turkic tribes such as the Avars became involved in this phase. (More at Wikipedia, https://en.wikipedia.org/wiki/Migration_Period). – So severe a frost all over Britain that the rivers were frozen up for about two months. In 633 AD The Islamic Invasions of the Middle East, Egypt, all of North Africa, as well as much of Europe, began after the death of Mohammed (632 AD). 1. Charles Peirce, A Meteorological Account of the Weather in Philadelphia from January 1, 1790 to January 1 1847, Lindsay & Blakiston, Philadelphia, 1847. 2. The Tablet of Memory; showing every Memorable Event in History, from the Earliest Period to the Year 1817. Thirteenth Edition, London, 1818.
http://www.phenomena.org.uk/Landmarks_index.htm [cited 19 June 2010]. 29. Where Thames Smooth Waters Glide: Frost Fairs, URL: http://thames.me.uk/s00051.htm [cited 20 June 2010]. 40. Tablet of Memory, Shewing Every Memorable Event in History from the Earliest Period to the Year 1783, Fifth Edition, 1783, G. Robinson, London. Edward J. Coale, Baltimore, 1829. 43. The New Tablet of Memory; or, Mirror of Chronology, History, Statistics, Arts, and Sciences, from the Earliest Period to the Year 1838, Fifteenth Edition, 1838, Longman et. al., London. 47. (Royal) Journal of the Statistical Society, Volume XLI – Year 1878, London, Edward Stanford, 1878. 60. M. Benoist, Dictionnaire de Géographie Sacrée et Ecclésiastique (Volume 3), Paris, 1848. 62. Franz Arago’s Sämmtliche Werke (Volume 8), Verlag von Otto Wigand, Leipzig, 1860. 72. Thomas Short, A General Chronological History of Air, Weather, Seasons, Meteors in Sultry Places and different Times, London, Volumes 1 & 2, 1749. 79. Joseph-Jean-Nicolas Fuster, Des Changements dans le Climat de la France, Histoire de ses Révolutions Météorologiques, Paris, 1845. 86. Cormac Ó Gráda, Famine: A Short History, Princeton University Press, Princeton, 2009. 90. Benjamin Vincent, Haydn’s Dictionary of Dates and Universal Information, G.P. Putnam’s Sons, New York, 1893. 91. Cornelius Walford, The Insurance Cyclopaedia, Volume III, London & New York, 1874. 92. Cornelius Walford, The Insurance Cyclopaedia, Volume IV, London, 1876. 93. Cornelius Walford, The Insurance Cyclopaedia, Volume V, London, 1878. 153. Shan-yu Yao, Floods and Droughts in Chinese History, their Distribution and Correlation, 206 B.C – 1911 A.D., University of Pennsylvania, Thesis, 1941. 171. Meteoromandie.ch, Evénements météorologiques de l’an zéro à l’an mil, URL: http://www.meteoromandie.ch/almanach-0- 1000.php [cited 7 June 2012]. 179. Prithwis Chandra Ray, Indian Famines: Their Causes and Remedies, Calcutta, 1901. 212. E.J. Lowe, Natural Phenomena and Chronology of the Seasons, London, 1870. This entry was posted in Climate & Weather, History, Islam, religion of peace - not so, Islamic jihad. Bookmark the permalink. Cause and consequence — What caused the decline and fall of the Roman Empire? Someone on Facebook, in relation to what is being presented in ‘Roman Warm Period : Timeline and Decline’, stated: “I suspect that the Roman empire was in decline mostly due to it’s internal political problems and the cooling was just the last straw. I also suspect the same drought, famine, plagues cycle will happen to modern societies when the cooling begins.” With that, he presented a modified version of the Alley temperature reconstruction. A very instructive debate of the issues identified by Andy May, is contained in the discussion thread that follows Andy May’s article. The key issue of Andy May’s deliberations and the debate following Andy May’s article is that the portion of the Greenland temperature reconstruction as shown in his original graph (shown above) exaggerates the magnitude of the Modern Climate Optimum (based on HADCRUT 4, calculated from daily temperature readings — shown in red — grafted onto the temperature reconstruction based on an analysis of the temperature proxy, the Greeland ice cores analyzed by Alley. As to the suspicion expressed by the FB commenter, without knowing what it would be, when I put together “Roman Warm Period : Timeline and Decline,” I had merely attempted to identify the places in the temperature timeline by Alley that corresponded to some of the records of individual, notable weather events that had affected the Roman Warm Period and its aftermath, focusing on the population trend of the City of Rome during that time. As I pointed out in the related articles, I am not a historian, but I am aware that the historical records of that time are rather sketchy, imaginative, patchy and incomplete. They reported some incredible things, such as people in white gowns having conferences in the sky, and that babies who were still in their mothers’ wombs spoke to and had conversations with their mothers. Still, on the whole, some weather events of that time are on record, and it is generally accepted that they contain the truth with respect to having happened, having been severe and having had massively deadly consequences. It stands to reason that cooling caused adverse weather events, that those caused famines and large numbers of deaths (even wide-spread deadly plagues), that those in turn caused more economic problems, with the consequences of those then having been that the Roman Empire became afflicted by internal political problems. All of that was interspersed with the massive disturbances of large migrations, invasions, by Northern European tribes that sought to find refuge in more Southern, more comfortable regions that happened to be located in the Roman Empire. The motivating force for those migrations was without a doubt that the Goths and the Vandals from the Northern regions of Europe would most likely have felt the consequences of the cooling climate much more intensely than the people in the more Southern, warmer Roman Empire did. The suspicion that those consequences of the weather events caused by cooling were followed by “the cooling was just the last straw,” is a non sequitur, as there appears little doubt that the cooling of the climate was what had caused the climate’s deterioration.. The weather events (I expanded the search to include not only Rome, but also Danube and Rhine) shown in the blog posting at the appended link illustrate that the Barbarian Invasions did not cause all of the famines but most likely took advantage of them (large portions of the population of the Roman Empire had died from starvation and disease, vacating their premises, so to speak, before the Barbarians came to occupy what the former tenants had left for them). 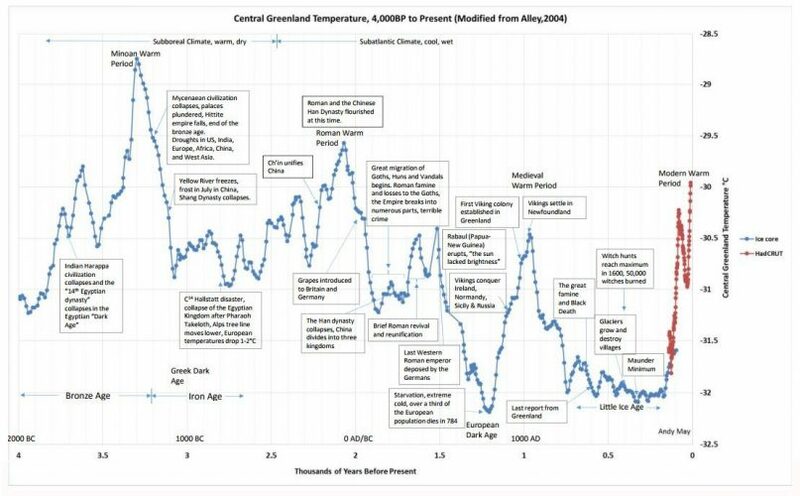 Moreover, the cooling of the climate would without a doubt have helped the Barbarians more than it did the Romans. For instance, on February 377 A.D. in northern Gaul, the barbarians crossed the Rhine River on the ice, and in the winter of 461 / 462 A.D. the Danube froze over, allowing the Barbarians to cross the Danube without having to attempt to contest the heavily defended bridgeheads held by the Romans, while both of those rivers had been convenient natural obstacles that secured the northern boundary of the Roman Empire, but take a look at the weather events that — whether they triggered or aggravated internal political problems seems to be of minor importance — must have thrown the economy of the Roman Empire into considerable turmoil that presented obviously insurmountable difficulties to the contemporary government administration. Some of those weather events triggered famines and plagues of such proportions that in a virtual blink two-thirds of the residents of many towns perished. The survivors hunted travellers for food and ate them. Residents of towns ate members of their communities, mothers ate the children to whom they had given birth…, but have a look at some of the accounts from those times. We can be reasonably certain that the Barbarian Invasions did not cause the cooling of the climate that began shortly after 1 A.D., as the Barbarian Invasions did not begin until about 300 A.D., when the cooling had been going on for some time.